Cast iron skillets are a timeless must-have for every kitchen! The Simple Chef® Cast Iron Skillet 3-Piece Set is heavy duty and virtually indestructible, so they will last you years, decades, and generations to come! Our skillets are factory pre-seasoned, so they are ready to use straight out of the box. Our cast iron cookware is multi-functional, and suitable for many different cooking methods. Use them on the stovetop, in the oven, over a campfire, and even when slow-cooking! They're perfect for frying, sautéing, cooking, grilling, and more. Plus our design has superior heat retention and conducts heat evenly, so your food will turn out great every time! Don't wait. 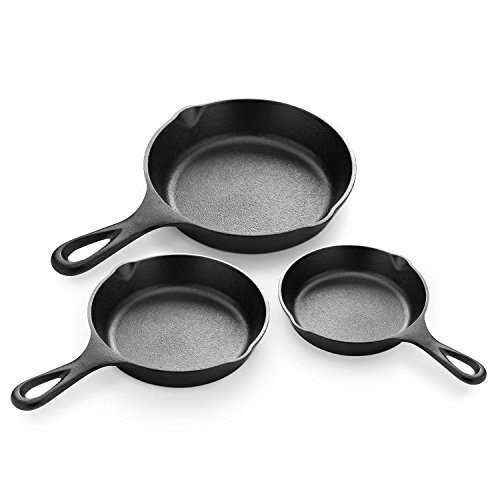 Purchase your own Simple Chef® Cast Iron Skillet 3-Piece Set NOW! HEAVY DUTY - Cast iron skillets are a timeless must-have for every kitchen. The Simple Chef® Cast Iron Skillet 3-Piece Set is virtually indestructible and will last years, decades, and generations to come! READY TO USE - The skillet set is ready to use, straight out of the box. They are factory pre-seasoned, which is much more effective than at home pre-seasoning. Factory pre-seasoning makes our cast iron skillets virtually non-stick, easy to clean, protected against scratches, and will also make your food rich in flavor! MULTI-FUNCTIONAL - Our cast iron cookware is multi-functional, and suitable for many different cooking methods. Use our skillets on the stove top, in oven, over a campfire, and even when slow-cooking! Our set is great for frying, sautéing, cooking, grilling, and more. HEAT RETENTION - Our design provides superior heat retention for cooking. And they conduct heat evenly, so that your meals will turn out perfectly cooked every time. Plus the sturdy handle aids in lifting, and provides a hole for hanging when not in use. If you have any questions about this product by Simple Chef, contact us by completing and submitting the form below. If you are looking for a specif part number, please include it with your message.